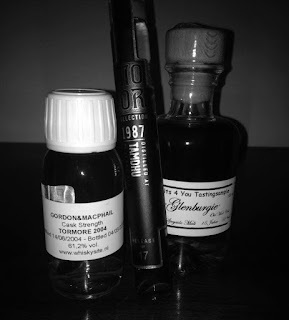 Most of you know that I mainly use samples and miniatures when preparing my Reviews. At the request of many of my readers I give preference to more recent expressions. As a result, my backlog of older samples has increased quite a bit. To do justice to those samples I will review them in the form of Specials. These specials will deal with a specific region like today or with specific distilleries, bottlers or countries. 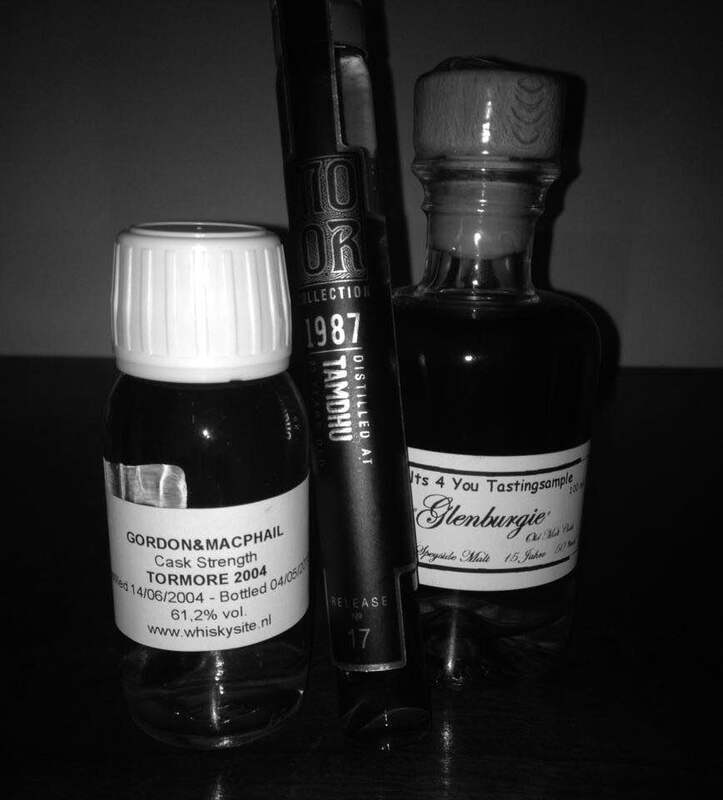 These reviews will concentrate on the Whisky and won't touch too much details about distilleries, maturation etc. I do hope you will like these Specials just as much as my regular reviews and I look forward to your reactions and suggestions. 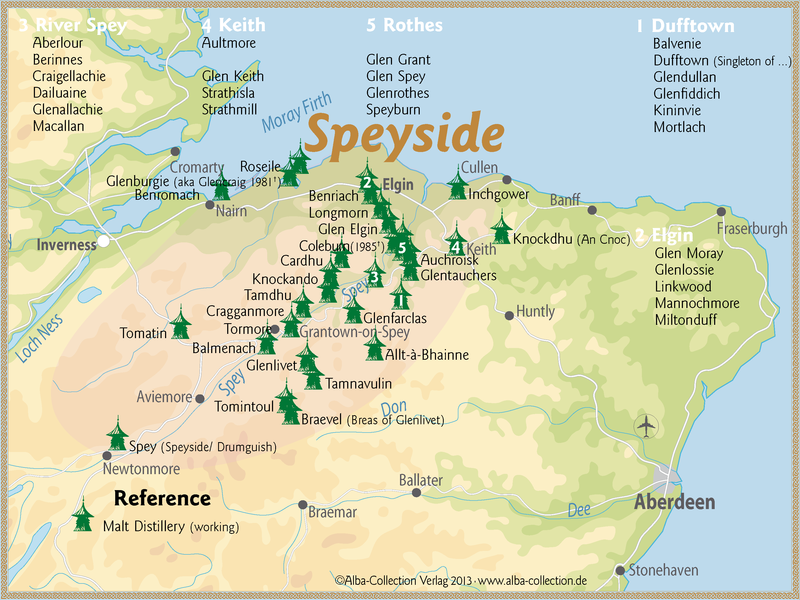 In this special I will review three random Speyside Single Malts. Enjoy! Buying Advice:😀Pleasant Easy-Going Speyside Malt with a good P/Q ratio 👍. Sweet and a little Meaty and Dusty. A few Sour notes as well. The Sherry Cask influence is clear. Please give this Glenburgie enough time in the glass before Nosing as the Alcohol is quite present. I find a little bit of Sulphur as well but it stays within acceptable limits. The Nose is okay but nothing out of the ordinary. Toasted Cereals, lightly Burnt Buttered Toast, Nuts, Dried Fruit like Sultanas & Plums, Caramel, Straw and Grass, Apple, Pear, Orange, Pineapple, Dried Herbs, Dusty Earth, Oak, Pepper, Mint and Cloves. Vanilla, Toffee, Heather Honey, Wax, Red Grapes, Red Berries, Grapefruit, Wet Rocks/Sand, Cinnamon and a twist of Lemon. Bitter Sweet, Malty and Fruity. A few Sour notes. Watch out because it goes down dangerously easy! Toasted and Malted Barley, Butterscotch, Caramel, Straw and Grass, Apple, Pear, Orange, Pineapple, Dried Herbs, Pepper, Ginger and Cardamom. Buttered Toast, Honey, Strawberries, Grapes, Lemon, Passion Fruit, Nectarine, Lemon, Nuts, Oak, Fruit-Flavoured Tea, Cloves, Cinnamon, Licorice & Nutmeg. Middle-Long. Bitter-Sweet with a few Sour notes. Quite Fruity. The Oak and Oak Spices are more noticeable towards the Dry end. A little bit of Alcohol remains present. I find Toasted and Malted Cereals, Butterscotch, Vanilla, Straw/Grass, Apple, Pear, Fresh Strawberries, Orange, Grapefruit, Pineapple, Wax, Dusty Track, Oak, Coconut, Pepper, Ginger, Nutmeg, Cardamom, Cinnamon, Menthol and Licorice. I added a few drops of Water and the Alcohol retreats on the Nose. But you will loose a bit of density at the same time. Palate and Finish do not change a lot. As usual adding Water is a personal decision. I prefer it neat but this Glenburgie easily accepts a few drops. The Glenburgie distillery was founded in 1810 by William Paul, initially under the name Kilnflat, It closed in 1870 & reopened as Glenburgie in 1878. Since 2005 the distillery is owned by Chivas Regal (Pernod Ricard). Glenburgie is one of the three main Malt components of the Ballantine's Blend. The other two being Miltonduff and Glentauchers. The only current official Single Malt is the 15 year old. Production amounts to around 4.2 litres per year. You can't go wrong with this Glenburgie. It's a Fruity and pleasant Speyside Malt that would be a perfect day-to-day dram if you like this type of Whisky. There's nothing really special about it but there's nothing wrong as well. Just easy-going and relaxing. The P/Q ratio is correct and I certainly recommend this Malt. Sweet, Clean and Malty. Not bad bud a bit plain and unexciting. The Alcohol is quite noticeable as could be expected given the very high ABV. Sweet Malted Barley, Buttered Toast, Vanilla, Caramel, Straw/Grass, Nectarine, Banana, Pear, Bounty Candy Bars, Dried Herbs, Cinnamon and Mint. Heather-Honey, Butterscotch, Toffee, Rose Water, Milk Chocolate, Charred Oak, Apple, Lemon, Gooseberry and Dusty Track. The Alcohol is very strong and it's quite difficult to find your way around it. This Malt definitively needs added Water. The Palate is Sweet, Tannic and Fruity and you will find lots of Oak and Wood Spice. Sweet Toasted Barley, Vanilla, Straw, Green Apple, Pear, Banana, Gooseberry, Oak, Pepper, Cinnamon, Ginger, Menthol, Mint and Cardamom. Heather Honey, Brown Sugar, Lemon, Grapefruit, Raspberry, Marzipan & Milk Chocolate. Middle-Long, Tannic and Bitter-Sweet. A few Sour notes as well. Increasingly Bitter towards the Medium-Dry end. Aggressive Alcohol. I find Sweet Barley, Vanilla, Herbal Cough Syrup, Straw, Banana, Pear, Oak, Lemon Grass, Pepper, Cinnamon, Menthol, Mint and Milk Chocolate. Adding a few drops of Water is a must in this case and you won't hear me say that a lot! The ABV of 61.2% is simply too high for this relatively Young Spirit. The added Water does not significantly change the overall profile but it's just a little easier to drink it this way. 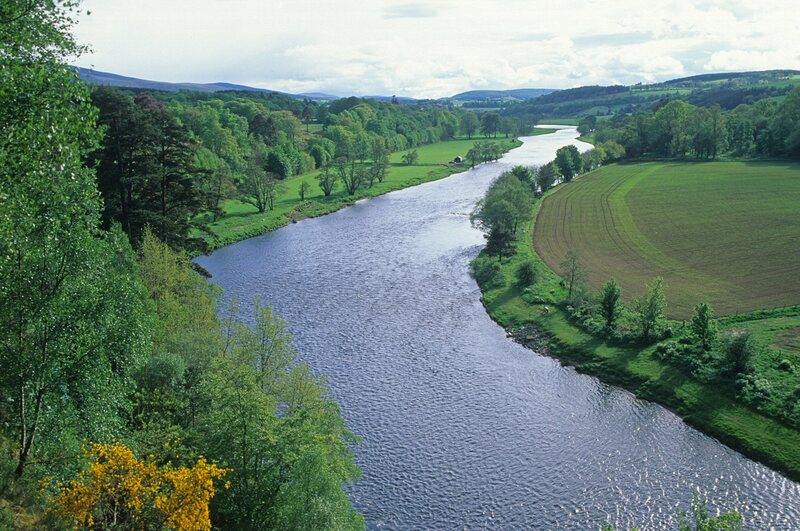 The Tormore distillery was founded in 1958 in Grantown on Spey by Schendley Int. who needed a Single Malt for their Long John Blend. Since 2005 it is owned by Chivas Regal (Pernod Ricard). Most of its production is destined for Blends like Long John, Ballantine's and Cream of the Barley. The two official Single Malts are the 14 & 16 Years. Production amounts to around 4.8 million litres per year. I'm usually a big fan of Gordon & MacPhail but in my opinion they have got this one wrong. I love Cask Strength Whiskies but this Tormore Spirit is simply too Young and, well delicate, to accept such a high ABV. As a result I can't find any balance here. I can pick up individual Aromas and Flavours but the sum of them is not coherent. It just does not seem to go anywhere. It's not a cheap Single Malt as well and given the above I would not recommend it. Price Range: Around US$ 140 for a 50 cl Bottle (January 2019)- Hard to Find! Buying Advice: 😀Nice Sherried Speysider. Should have been bottled at CS. Sweet, Mature and Complex. Clear Sherry Cask influence. Lots of Dried Fruit, Nuts and Dark Chocolate. The Alcohol is nicely integrated. The Oak is there as well of course and it's a bit Dusty but it's just part of the Aroma profile and does not dominate. Nice! Toasted Barley, Buttered Toast, Vanilla, Dried Fruit (Apricot, Raisins, Dates), Mixed Nuts, Orange Marmalade, Dark Chocolate, Dried Herbs, Nutmeg, Ginger and Cinnamon. Heather-Honey, Butterscotch, Straw, Red Apples, Dusty Oak, Dry Earth, Mint, Leather, Tobacco, Licorice and Espresso. A little on the Thin side which comes unexpectedly after the fine Nose. On the Palate this Tamdhu is Medium Sweet, quite heavy on the Sherry but with a few Herbal, Bitter and Sour notes for balance. Dry towards the end. Toasted Barley, slightly Burnt Toast, Vanilla, Dried Fruit like Raisins, Apricots and Dates, Orange Marmalade, Dark Chocolate, Mixed Nuts, Espresso, Pepper, Ginger and Mint. Heather-Honey, Caramel, Toffee, Treacle, Straw, Dusty Oak, Dry Earth, Red Apples, Fruitcake and Lemon. Middle-Long, Dry and a little Thin. Mostly Sweet but with a few Bitter, Herbal and Oaky notes as well for balance. I didn't notice it on the Nose but Palate and Finish clearly show that this Tamdhu should have been bottled at Cask Strength. I find Toasted Barley, slightly Burnt Toast, Dried Fruit like Apricots and Raisins, Orange Marmalade, Honey, Dark Chocolate, Mixed Nuts, Espresso, Dusty Oak, Dry Earth, Tobacco, Pepper, Menthol and Aniseed. On account of the small sample, I only tasted this Tamdhu Neat. It didn't feel like it on the Nose but Palate and Finish clearly show that this Tamdhu should have been bottled at Cask Strength. 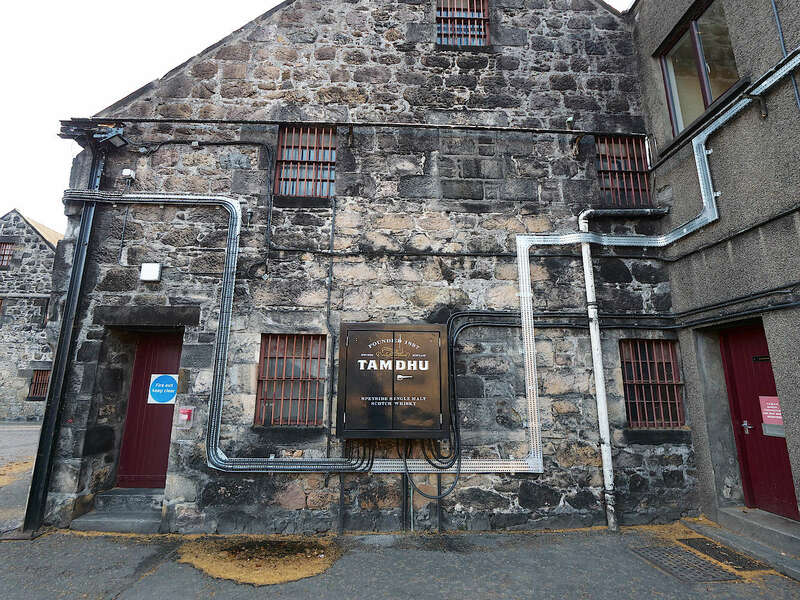 The Tamdhu distillery was founded in 1896 by a group of Blend producers lead by William Grant. Ian MacLeod Distillers bought Tamdhu in 2011 from Edrington and it currently produces around 4 million litres per year. Tamdhu is used in Blends like Cutty Sark, J&B and the Famous Grouse but more and more it also produces Single Malt whiskies. The core range includes the 10,12 and 15 Years. This Tamdhu is a nice Sherried Speysider but I do think that Mo Or should have bottled it at Cask Strength. As it is, Palate and Finish are a bit on the Thin side and slightly disappoint after the very nice and full Nose. A 23 Year old Whisky can't be cheap of course but at Cask Strength the P/Q ratio would have been in order even considering it would have been a bit more expensive. Since it was bottled at 46%, I find the price tag a bit hefty though.